McAllister and Dundalk's Robbie Benson with the EA Sports Cup trophy. 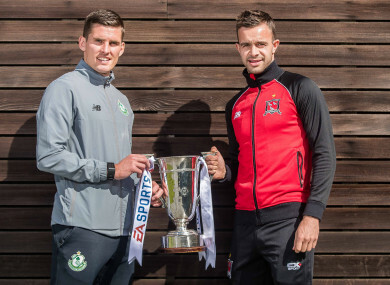 DAVID MCALLISTER WAS chatting to a team-mate at Shamrock Rovers’ training facility in Roadstone on Wednesday when it dawned on him just how important tomorrow’s EA Sports Cup final is (3pm, live on eir Sport). “I was talking about this with Mikey O’Connor this morning in training. He said ‘This is the biggest game of my career’, and I said ‘Mikey, I think it’s the biggest game of my career’ because I was over in England but didn’t get to any finals. He may not have any silverware to show from a six-year spell in English football, but the midfielder still has plenty of fond memories. Having lined out for Drogheda United, Shelbourne and St Patrick’s Athletic, Dubliner McAllister joined Sheffield United in 2011. Handing his full debut against Bristol City at Bramall Lane, he marked the occasion with a goal — an unstoppable strike from 20 yards. There were FA Cup ties against Everton and Aston Villa that stand out too as well as a play-off semi-final at Wembley. “I suppose making my debut in the Championship was a bit of a highlight,” McAllister says. “It was against Bristol City and I managed to score in that one. Then after a few months, we had a couple of big cup games against Everton at Goodison Park and Aston Villa at home. He also had stints at Shrewsbury Town and Stevenage, but the latter years were dogged by injuries and on a couple of occasions he felt that packing in football might be the smart move. However, a phone call from fellow Rush man and Shamrock Rovers sporting director Stephen McPhail persuaded him to return to Ireland and sign for the Hoops. McAllister had idolised the former Ireland international as a boy and even lined out against him in the Championship. “I’ve got a little collection of jerseys at home,” he says. “Probably my most prized one was Stephen McPhail’s from when he was at Cardiff. I’ve also got a picture of him when I was 10. I was at the Stephen McPhail summer camp with Rush Athletic. He was 18 and I got player of the tournament. He’s presenting the award to me with his little blondie tips and crooked teeth. After an inconsistent start to this season, Rovers appear to have gelled in recent months and they head into Saturday’s final at Tallaght Stadium against Dundalk on the back of seven straight wins in all competitions. For McAllister, the 2-1 victory at home to the Lilywhites back in May was a real turning point. “We’ve had a couple of big wins, but I think it was that one in Tallaght against Dundalk because they were such a big team and had won so much in previous years. They were in good form at the time and they came to us. Rovers hadn’t beaten a top four team in quite a while so I think that one gave us the belief as a whole squad. With an array of attacking talent at his disposal, Rovers boss Stephen Bradley has tasked McAllister with the holding midfield role and it is one he’s happy to fill. “At the start of the season, I was a bit more advanced but Stephen has moved me back a little bit,” he says. “I don’t mind. With the attacking players we’ve got in the team, I’m not up to their calibre so I’m happy to sit back, break up play and give it to them. He also believes there is a good mix of experience and youth in the team right now. “We were talking about depth in the squad and you lose Graham Burke to a bad knee injury and Aaron Bolger comes in and gets man-of-the-match for me against Cork. Gary Shaw was missing the other day [against Bluebell United] but we didn’t struggle for goals with Brandon Miele getting a hat-trick and Ryan Connolly scoring another. Miele was the stand-out performer as Rovers booked a place in the FAI Cup semi-final, where they will also face Dundalk on 1 October. It’s two-and-a-half years since the Tallaght native joined after returning home from Newcastle United and lining out for Bluebell briefly. Since then, he has become one of the club’s most important players. “Brandon has been brilliant,” adds McAllister. “He seems to score one and then he’ll go on a run for four or five games hitting goal after goal. “He is quiet in the dressing room but he’s one of those who just demands respect. That’s who Brandon is. He goes out onto the pitch and he’s not shouting and roaring in the tunnel or anything like that. He just does the job week in week out and he has been great. It’s a big couple of weeks for the club, starting tomorrow, as they can pick up silverware, cement third place in the Premier Division and book their spot in the FAI Cup final. Now in his late 20s, McAllister knows that opportunities like these need to be taken advantage of. It’s four years since the Hoops last lifted a trophy and competing for major honours is where they belong, according to the midfielder. “Look at a club like Rovers, how massive they are and how successful they’ve been in previous years. It’s where they belong, it’s not good enough to be finishing fifth or sixth in the league and not competing for anything. With the fans and the investment in, it should be kicking on for medals and trophies. Email “'I think it’s the biggest game of my career because I didn’t get to any finals over in England'”. Feedback on “'I think it’s the biggest game of my career because I didn’t get to any finals over in England'”.